PEACH is back in Europe for 2018! 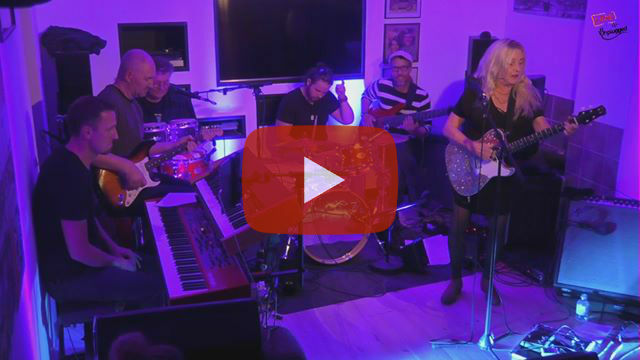 PEACH kicks off her 2018 European tour performing at Café Bartof with the Almost Blues Band (Björn Jönsson - Drums, Helge Solberg - Bass, Michael Engman - Guitar + Vocal). PEACH'S newest CD is now available for online purchase with FREE SHIPPING WORLDWIDE! 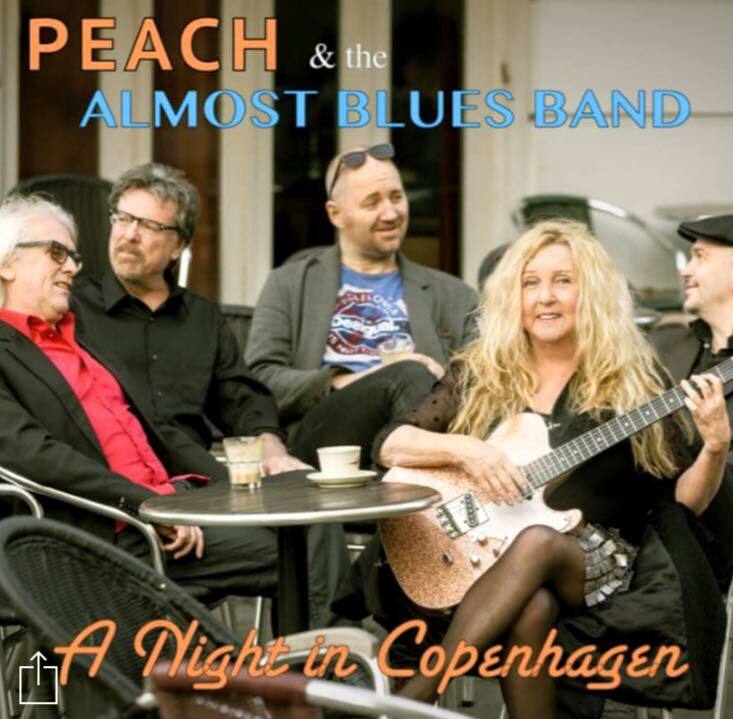 A Night in Copenhagen is a live recording audio CD of PEACH & the Almost Blues Band from their February 2016 performances at Bartof Café in Frederiksberg, Denmark. And now on iTunes and Amazon as full album or individual track downloads! Enjoy a sample - "Come Up And See Me Sometime"
"We're gonna have with us PEACH - guitarist out of California who is making her way through Europe and making a real splash..."
PEACH performs "It Meant Nothin" from May 13, 2013 at The Talking Stick Cafe. 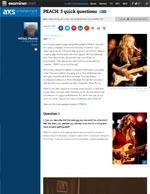 Listen to PEACH on the "Big Wayne’s Audio Review - Women In Music Feature" playing on Blues-E-News. Listen for PEACH on the "Ain't Nothing but Bob Blues Show" on Dekadance Radio - Tuesdays and Fridays at 5pm EST. Listen for PEACH on "The Wimmin's Show" on KZUM 89.3 FM, Lincoln Nebraska, Sundays from 10-12 PM Pacific / 12-2 PM Central. Listen for PEACH music with host D.C. Hathaway on D.C. Coast To Coast on USA FM and Livestream. Listen for PEACH music on the Dr. Wart Hoover Blues Hour on Severn FM broadcasting from Gloucester, England. Listen for PEACH music on the Mo' Blues Show airing Wednesdays 2-4pm Eastern time at Goldradio. 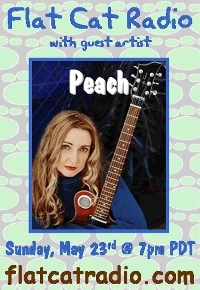 PEACH is Special Guest on The "IN" Show on Thursday 18 JUL 2013 from 1-2PM Pacific. PEACH joined Take 2 Radio for a chat about her career, her new music, upcoming tour, and being the co-founder of Rock 'n Cure. Aired on 14 JUL 2013. PEACH live on Behind The Mic Radio on Monday 15 JUL 2013 at 5pm PST/8pm EST. Call in and interact: 347-945-6965. Listen for PEACH music on Blues 4 U broadcasting from Križevci, Croatia. PEACH on "Music On The Couch"
PEACH interviews and performs on "Music On The Couch" with Vinny Bond on Mar. 03, 2014. 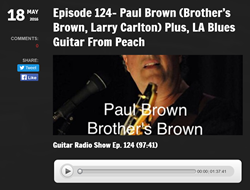 SoCal blues guitar goddess PEACH interviews live on Jimmy Warren's "America's Blues Radio" show. Listen to the interview audio archive [MP3 | 77 MB]. Listen to the two JAZZED AND BLUE interviews with PEACH, presented by Rockwired.com. PEACH loves connecting with fans and is now on Facebook, Twitter, MySpace, Instagram, and YouTube. Let's get connected! 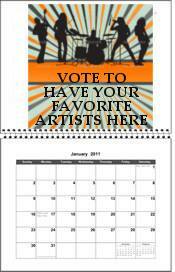 Catch PEACH performing over the next several months of 2013 at locations like H.O.M.E. (House of Music & Entertainment) (06/26, 07/24), House of Blues - Anaheim (08/02), The Talking Stick (08/15), and The Real Blues Festival of Orange County (09/08). Keep watching for more details and new events! PEACH will perform at Old Town Temecula Community Theater at 8 PM on Friday, June 5, 2009. All*Access Magazine's Blog has news about PEACH. The September 15, 2008 article is "PEACH: I Should Get One Song Out Of A Break-up" by Gary Schwind, published in BrooWaha Los Angeles. PEACH will perform at Louis's Fish Camp in Las Vegas, NV at 8 PM on Friday and Saturday, June 13 and 14, 2008. PEACH wishes to thank all her fans for their support and their internet voting. PEACH is the recipient of the award for Best Blues Group/Artist 2007 at All Access Magazine Music Awards held at the Knitting Factory, Hollywood, CA on November 03, 2007. PEACH and her full band will perform at the Arcadia Blues Club in Arcadia, CA on Friday, November 09, 2007. PEACH'S album, "The Real Thing" is given a glowing review by Brian Ball, Music Editor for Women's Radio News. PEACH NOMINATED FOR SEVERAL AWARDS - NEEDS YOUR VOTES! Be sure to vote for PEACH for both awards and in all categories! PEACH and her all-star blues band will perform at the House of Blues in Anaheim on Friday and Saturday, July 06 and 07. PEACH will perform at The Key Club on Sunday, July 15, 2007 @ 8:30 PM for the Emergenza Festival Finals. At stake is an all-expenses-paid trip to Europe as determined by audience vote & music biz judges. Join the crowd and help PEACH WIN! PEACH WINS ROCKWIRED FEMALE ARTIST OF THE YEAR! RADIO FEATURE THIS SATURDAY. PEACH has been selected by Rockwired.com listeners and fans as the Best Female Artist Showcased by Rockwired in 2006. Rockwired will feature PEACH and other award winners on its radio show airing Saturday, April 7 at 5:00 PM (PST). Wednesday, May 30th, 9:00 pm. PARTY WITH PEACH THIS SATURDAY NIGHT! Saturday, March 24th from 9:00 pm 'til 1:30 am at Runaway Bar in Torrance. Dance the night away with PEACH as she performs with Mike Turner (guitar, vocals), Ken Stange (keys), Tom Walsh (drums), and Steve Nelson (bass). PEACH will be be playing with her "hip-hop" guys: Minimalist - keys, Del Atkins - bass, Lance Lee - drums, Jimmy Roberts - sax. Thursday, November 30th from 10 am-12 pm on KUCI 88.9 FM - broadcasting over the air and online from University of California, Irvine. Listen live at www.KUCI.org. Performing on Friday and Saturday, December 8th and 9th, starting at 10 pm, with full band: Ken Stange, Tom Walsh, Jimmy Roberts, Eric T. Ward, guest guitarists Joey Delgado & Burton Zimmer. PEACH is playing every WEDNESDAY from 8-11 pm at the Runaway Bay in Torrance. Her house band is Ken Stange (Joe Cocker, Dennis Quaid) on keys, Tom Walsh (Joe Cocker, Dennis Quaid) on drums, and Eric T. Ward (Marvin Gaye) on bass. PEACH reports that it's a really fun and relaxed atmosphere, no cover, great hang... check it out! PEACH will be performing every Friday in May at The Ritz-Carlton - Laguna Niguel. This is an unusual performance as PEACH will be playing jazz as well as R&B. Some of her newly written tunes will also be featured. 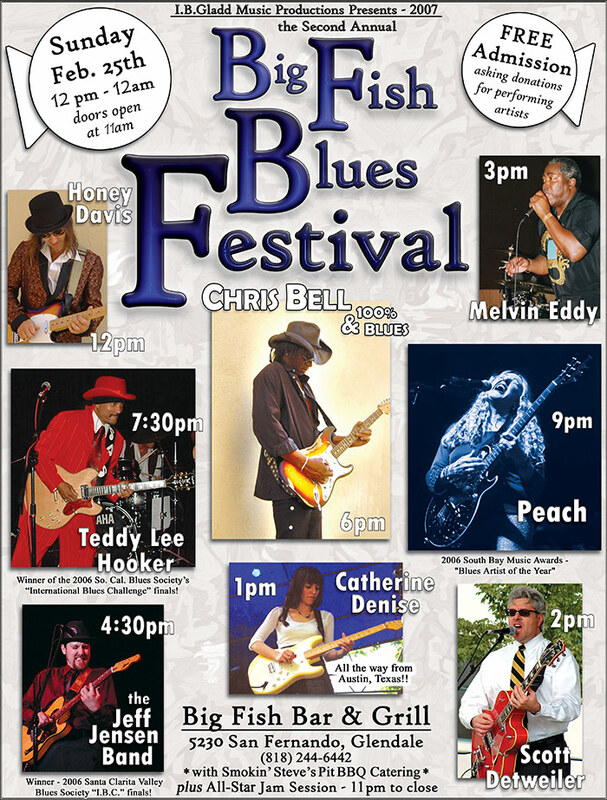 PEACH is pleased to be one of the headliners for Southbay Blues Festival to be held at the Normandie Casino, Gardena, California on Sunday, September 18th. PEACH's band will play from 4:00-5:30 pm. Other performers to include Zola Moon, Oscar Jordan, Jimmy Z, Deacon Jones. Guest guitarists Kimberly Allison and Joey Delgado will be sitting in with PEACH and her band. Blues Rock Records is proud to announce that PEACH is endorsing a new line of guitars by Spirit Musical Products. PEACH will be performing at NAMM show in Anaheim, CA on January 21-22, 2005 (look for her at the "Lace booth"). July 5, 2004 - The Los Angeles Music Awards announces the selection of PEACH - The Real Thing for "Blues Album of the Year" for the 14th annual gala to be held in Los Angeles, November 18, 2004. PEACH releases her third album, The Real Thing, featuring a duet with the legendary Taj Mahal. 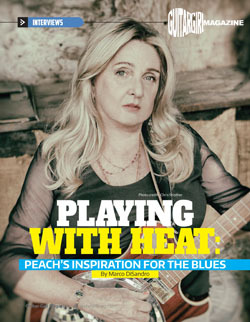 L.A.-based contemporary blues artist PEACH is joined on her newest release The Real Thing by a group of players that reads like the Who’s Who of American rock and roll. 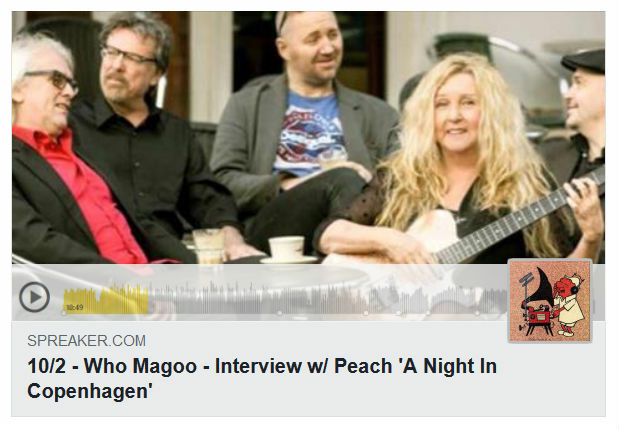 On her latest album PEACH collaborates with greats like Taj Mahal, Garth Hudson (The Band), Paul Barrere (Little Feat), James Gadson, Lee Thornburg, Amos Garrett and Reggie McBride. This compilation of soulful original blues and jazzy ballads was produced by Marty Grebb, former music director for Bonnie Raitt. The Real Thing CD is available for purchase from Amazon.com, Tower Records and Virgin Megastores. PEACH rocks out with her high-powered all-woman band on the second dayof the 102nd Annual NAMM convention in Anaheim, California. Over 70,000 delegates in the music product and recording industry attended this four-day show.